Joshua Molloy first began fighting with Kurdish resistance fighters the YPG in march of last year. THE 24-YEAR-OLD Irishman being held by authorities in Iraq joined the fight against the so-called Islamic State after becoming sickened by their rise and the atrocities they committed. Joshua Molloy, originally from Ballylinan in Co. Laois, served in the British Army for four years before joining Kurdish resistance fighters the YPG to fight against Isis. TheJournal.ie understands that it was plight of the Yazidi people near Sinjar in 2014 that convinced him to fight with the Kurds against Isis. That same city last week became the site of his arrest. Molloy, as well as British nationals Joe Akerman and Jac Holmes, was arrested by authorities from the Kurdistan Regional Government (KRG) on Friday having allegedly entered Iraq illegally from Syria. Mark Campbell, a Kurdish rights campaigner who has been in contact with Molloy’s parents and those of the other men, said that the men planned to cross into Iraq at a known border crossing but that it was closed. This meant that they were forced to take a different route, leading to their arrest when the reached the town of Sinjar. I was in contact with Joe Akerman on WhatsApp and Joe had messaged me on the Wednesday morning to that they had arrived in Shingal (Sinjar). One of the last messages he sent me was that they were waiting for a contact to take them on. Speaking to RTÉ’s Liveline, the soldier’s father Declan said his son had seen the crisis in Syria as a humanitarian one and did not consider himself a freedom fighter, despite media reports suggesting he had referred to himself as such. “His intention was to go over there and help in any way he can,” he explained. It’s just ironic that these young men have gone over there, particularly to Syria in order to help where they can and then being held by the same people or those ally to them. It’s a difficult situation. The young man was not “interested in the ideology or political situation”, according to his father, though he did see Isis as a “severe and deadly problem” for the people of the region. Molloy first began fighting with the YPG in March of last year for three months before returning in October. It’s believed he was involved in actions in a number of areas in the Civil War ravaged country. Both he and the two British nationals have now been held for five days with the UK’s Foreign Office saying that it has been in contact with local authorities. The Department of Foreign Affairs says that it is ‘working actively’ on the case. “We are aware of the case and are working actively with partners on the ground to resolve it. Minister Flanagan is closely monitoring the situation,” the department said in a statement. Campbell says that Molloy’s parents as well as those of the other men have expressed hope that he will be released on humanitarian grounds. He adds, however, that the situation is complicated by relative unknown of the attitude of KRG officials towards foreign fighters in the YPG. “It’s day five now, and the family of Joshua were really hoping that diplomacy would be able to solve this,” he said. The family would just like to make an appeal to the Kurdistan Regional Government to, you know, please just to release there son. Especially as he had come against the Kurd to fight against Isis. 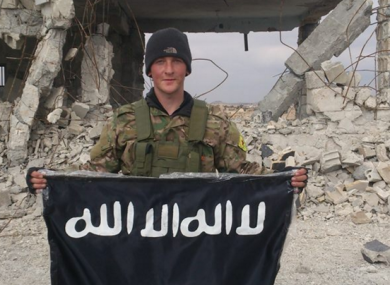 Email “Irishman Joshua Molloy became foreign fighter in Syria after seeing Isis atrocities ”. Feedback on “Irishman Joshua Molloy became foreign fighter in Syria after seeing Isis atrocities ”.